Brooklyn art opening fashion. 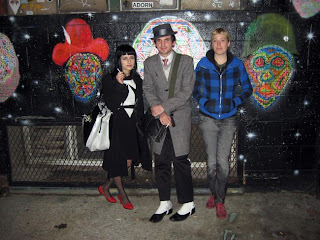 First, Jeremy's spats caught my eye, then the clever coordination with Mashinka's black and white dress, coat and bag. She's perfectly geometric and deco- chic. Mashinka likes Betsey Johnson and shops Macy's Herald Square, where she just got Betsey Johnson shoes. Of course I reminded her of Betsey Johnson's intimates line, also at Macy's and perfect for Mashinka. Kelley shops vintage and is partial to the French apparel, which reminded me of Isabel Marant (below, in W magazine article) in "those French girls" article in W this month. Does this not look like Kelley? I love the surprising shoe with the skinny jean and rustic top. Favorite quotes from the article: "I think it's my French side. There's always a masculine, androgynous look;" and on showing after and sharing models with Dior for spring 2008, "We're both in the Tuileries, so I'm going to do a big car-wash corridor between his tent and my tent...The girls just go through the car wash and come out on my stage. You won't recognize them." A model car wash, if only. Remember this aesthetic in the upcoming months: Marant says she loves mixture, "Putting a very tailored jacket with something that is really fluffy..." This can be spring's motto, as it is full of transparent fluffy things. Get tailored jackets at H&M on the cheap, or spend a little more for a Zara Women pantsuit. Then go to Meridian, where you'll always find a lovely and light feminine underpinning or skirt. Such fun finding so many great blouses and skirts in one small store.